Peterborough director of football, Barry Fry, has revealed his club had a bid of that amount turned down for the in-demand striker. Kenny Jackett is keen on bringing in the hitman, who Cheltenham have put a £1.5m valuation on. That's with Conor Chaplin's future in doubt and Coventry leading a number of clubs interested in landing the 21-year-old. Pompey would have to spend big, though, to bring in Eisa as Chaplin's replacement. 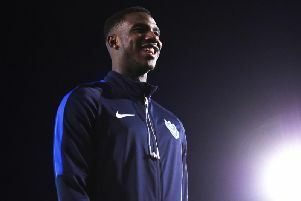 A host of Championship sides are said to be interested in the 23-year-old. Fry told the Peterborough Telegraph: 'We bid a million pound for Eisa and we couldn’t believe it when it was turned down, but his agent said he has a Championship club interested so good luck to him. 'We’ve been chasing Eisa since he ran us ragged in a friendly last summer, but we haven’t managed to pull it off. We should have brought him back with us after the game in Cheltenham. 'It’s been a difficult market recently. We have lodged several bids for several players, but nothing is moving. The manager wants more players and we are trying our best for him.